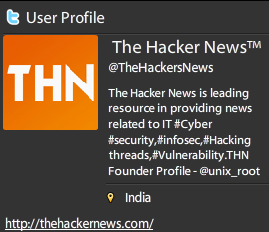 The Hacker News (THN, thehackernews.com), not to be confused with the venerable Hacker News Network (HNN), is a relatively new site that seeks to aggregate news related to computer security and hacking. Most aggregation sites simply compile news from other sources, providing proper citation in the form of a link and reference to the original. 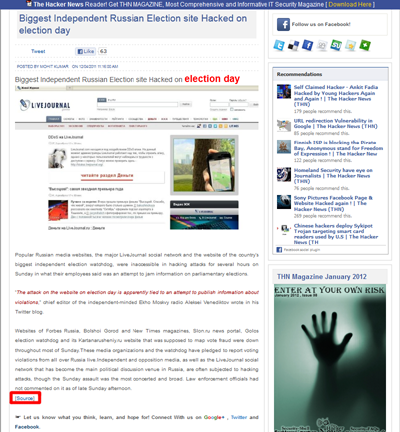 THN opts to "write" their news articles instead, rarely providing a reference to the original source(s). 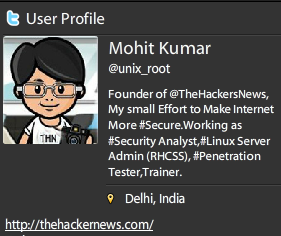 The site is based in India and run by Mohit Kumar (@unix_root on Twitter). According to their about us page, THN offers "training and knowledge-based solutions". Kumar's statement is false. As of this article, only 3 of the first 50 articles we examined provided source attribution. Going back over a month, a majority of articles are still not sourced. More interesting is Kumar's claim that "most of the news [is] submitted by Followers" when every single article we examined was posted by Mohit Kumar. Even if followers are submitting the stories, Kumar himself is the one posting them. As such, it is his responsibility to ensure the articles are properly sourced. Since many articles are a combination of his own writing along with portions plagiarized from the original source, we do not believe that most articles are submitted to him. The few articles that do provide a link to the source do so in a fashion that is not appropriate for citation. Looking at the following screenshot, it is clear that the article title, byline, and bulk of the text offer no indication that it is sourced from elsewhere. Only a small [Source] is provided at the bottom. In many cases, it is the source of some material in the article. This mixed content, using some material verbatim without attribution, is the textbook definition of plagiarism. While there are probably countless other news portals similar to THN, they have over 33,000 Twitter followers and boast they are "internationally recognized" and "a leading news source". 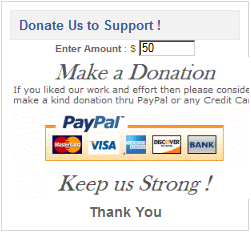 Considering they also prominently display a "Donate" box on every page, that means The Hacker News is likely profiting off the plagiarism and copyright violations. Should you wish to complain, they conveniently publish their DMCA Policy that requires you to write to them under the formal guidelines of the Digital Millennium Copyright Act to request copyrighted material be removed. Knowingly posting plagiarized material and then forcing the original authors to go to these lengths to have content removed is unethical and underhanded. The following table details a brief sampling of 10 articles examined for plagiarism and copyright infringement, without proper source attribution. Both the THN and original article are provided, along with the date each was published. Most articles consist of some original content, written by Mohit Kumar, along with some material that is verbatim from the original source. A few of the articles examined took material from multiple articles to piece together the THN article. In some cases, Kumar will use an HTML link to a source used by the article he copies from, which is not proper citation and does not excuse the willful infringement of copyright and inexcusable plagiarism.